Members receive the Society’s exclusive publication, which is the Atlantic Daily Bulletin(the name of the White Star Line news sheet), which is issued quarterly. This is sent free of charge to members, by airmail if overseas. We also provide a membership card. £20.00 for UK membership; £27.00 for EU membership; £32.00 for Overseas membership. Payment of membership is due in April of each year, but you are welcome to join at any time. Joint membership is also available at no extra cost, providing that only one copy of the bulletin is sent. We also take payment by PayPal. Does the time of year I join the Society determine what issues of the Atlantic Daily Bulletin I receive? 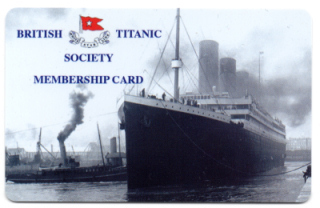 Our membership year runs from the 1st April to the 31st March the following year. You are free to join at any time. If you join later in the membership year, when copies of the Atlantic Daily Bulletin have already been sent out, you will receive the back issues that have been issued so far in the membership year and future issues as they become available. Our journal is published quarterly and posted out in June, September, December and March. If you apply for membership in the last month of the membership year, we will assume, unless you state otherwise, you are applying for membership for the following year.